The tooth structure has two main sections, the root and the crown. The root is the section of the tooth that is below the gumline. A dental implant acts as the restorative for this section of the tooth. The metal implant acts as an anchor in the jawbone. The first step of the procedure is surgical placement of the implant. Under regular dental anesthetic, the gum tissue is opened and the dentist places the implant into the jawbone. When this is achieved, the tissue is then sutured closed. There is not often significant discomfort with this procedure. This process can take from 1-3 hours depending on the number of implants being placed. 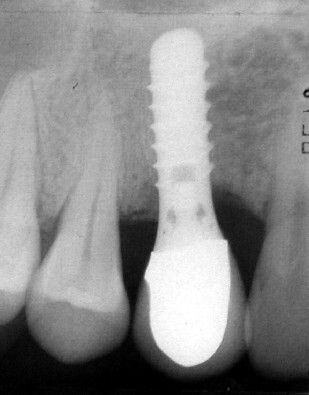 This implant will be left untreated for a period of 3-6 months. During this time, the bone will grow around the implant in a process called osseointegration. A removable crown may be utilized during this time period to allow for chewing and to preserve the cosmetic appearance.. The next step in the process is to attach an abutment to the tooth. 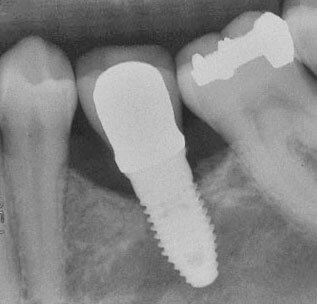 This is achieved by exposing the top of the implant and placing the abutment. This is the part of the implant that will support the final crown. Finally, an impression is taken of the implant and a final restoration is crafted. This restoration will be comfortable and cosmetically pleasing. Your completed implant will be fully functional, allowing you to resume normal activities. We proudly offer dental implants at our convenient location in Red Wing, MN. Quality dental implant restorations provided by Dentist George Noesen and staff at our beautiful MN office.